Dreaming with Open Eyes examines visual symbolism in late seventeenth-century Italian opera, contextualizing the genre amid the broad ocularcentric debates emerging at the crossroads of the early modern period and the Enlightenment. Ayana O. Smith reevaluates significant aspects of the Arcadian reform aesthetic and establishes a historically informed method of opera criticism for modern scholars and interpreters. Unfolding in a narrative fashion, the text explores facets of the philosophical and literary background and concludes with close readings of text and music, using visual symbolism to create readings of gender and character in two operas: Alessandro Scarlatti's La Statira (Rome, 1690), and Carlo Francesco Pollarolo's La forza della virtù (Venice, 1693). 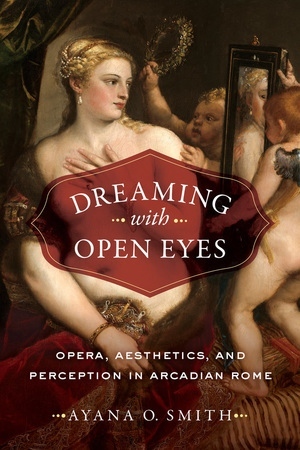 Smith’s interdisciplinary approach enhances our modern perception of this rich and underexplored repertory, and will appeal to students and scholars not only of opera, but also of literature, philosophy, and visual and intellectual cultures. Ayana O. Smith is Associate Professor of Musicology at the Jacobs School of Music at Indiana University. Her research focuses on interdisciplinary critical approaches to music and text in seventeenth-century Italian opera.